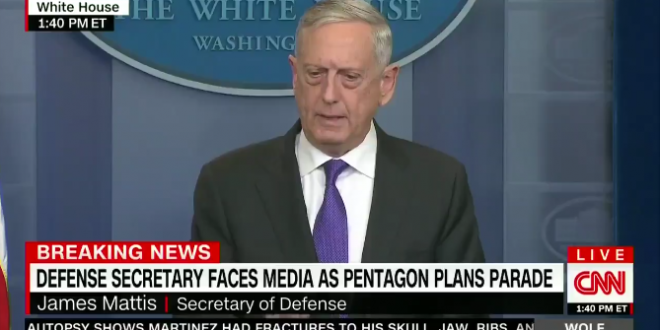 Mattis Dodges On Cost Of Trump's Military Parade - Joe.My.God. Defense Secretary James Mattis on Wednesday dodged a question about why the Pentagon should spend time and money planning a military parade requested by President Trump when the military has been complaining about budget woes. “I think what my responsibility is to make certain I lay out the strategy and make the argument for the oversight of Congress to make the determination of fully funding us. As far as the parade goes again, the president’s respect, his fondness for the military, I think is reflected in him asking for these option,” Mattis told reporters at the White House during a briefing. Republican Sen. Lindsey Graham says he supports President Donald Trump’s plan for a military parade in Washington – as long as it’s not a “cheesy” show of military might. Graham said on Twitter Wednesday that any parade should focus on “sacrifice, and saying ‘Thank You’ to those who protect our nation.” He also told CNN that a parade risks being “kind of cheesy and a sign of weakness” if it’s just about showing off military muscle.